WARSAW – Sometimes life will throw little tiny rocks at you, reminding you of your place in the world. Or at least where you can be among it. 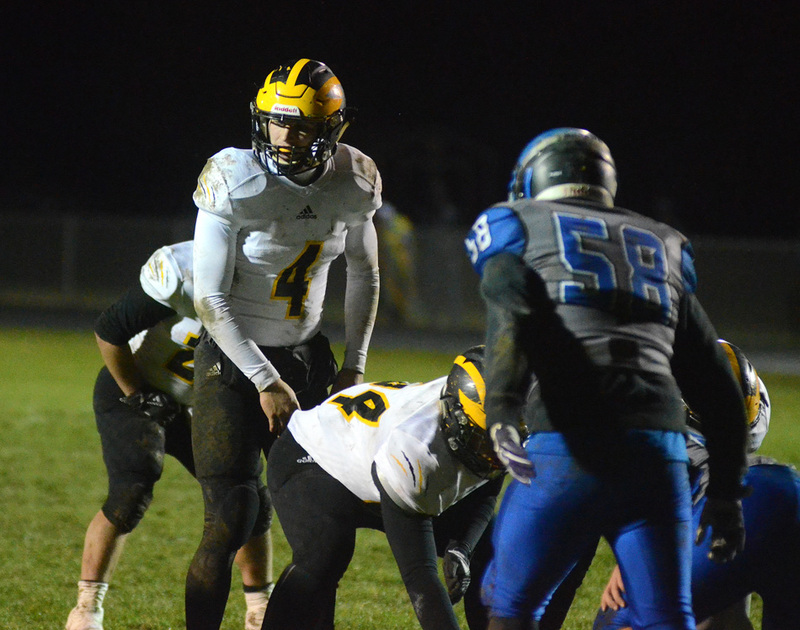 It was fitting and poetic in a way that an email sent around by Triton athletic director Mason McIntyre Wednesday afternoon about sportsmanship was issued around the same time that the 2018 Mr. Football award winner – Jack Kiser of Pioneer – was announced. The note, which was constructed by the IHSAA as part of its continued sportsmanship initiatives, went on to encourage fans to basically act their age and set the example for young people. Nothing new, the IHSAA has been trumpeting this horn for a long time now, and considering the number of instances where poor sportsmanship and violence has entered the athletic arena, the reminders seem needed. What struck me personally in that moment I read the email Wednesday, then went on to see Kiser was named Mr. Football, was the backlash that ensued and the continued ugly that bleeds from the word ‘fanatic’. To begin, Kiser was a worthy choice for the award. I stated during their sectional run that he was likely a frontrunner to win it, regardless of what anyone in Indianapolis or elsewhere did in the state tournament. Kiser is that good. So good, in fact, that he is going to Notre Dame next fall to play for Brian Kelly and the Irish. Triton head coach Ron Brown, linking back to the Trojans, said during the lead-up to Pioneer’s shutout of Triton in the regional that Kiser was the best player in the state. “Hat’s off to a team like that. More teams in the state of Indiana should emulate Pioneer, and if there’s any doubt who Mr. Football should be, it’s Jack Kiser,” Brown said after the 66-0 regional game that had Kiser and the Panthers blow out the Trojans. Pioneer gave up a total of six touchdowns all year. SIX. The Panthers scored 60 or more points in 10 of their 15 wins. Kiser had almost 3,300 yards of total offense and had 44 rushing and 18 passing touchdowns. He made over 150 tackles and was on the plus side of 12 takeaways as a linebacker, where Notre Dame is looking to plug him in. His team won 60-0 in the state championship game, their second straight title in Class 1-A and second straight undefeated season. Kiser, which has a likeable, Andrew Luck delivery and demeanor to him, has said all the right things and truly seems humbled by the award. He’s the first player from Class 1-A to ever win the award. The last from a small school was when current Dallas Cowboys linebacker Jaylon Smith, who starred at Notre Dame, won the award at Class 2-A Fort Wayne Luers in 2012. Here’s where the overriding point of this comes, and where the tie-in to the IHSAA email surfaces. Thus one sentiment among dozens spoken by a William Walker on Twitter Wednesday afternoon, responding to the Indianapolis Star’s announcement of Kiser winning the award over Warrren Central’s Bell, NorthWood’s Bronson Yoder and Evansville Memorial’s Michael Lindauer. It only got more ugly from there, mostly those responding to the Indy Star and Kyle Neddenriep’s initial post announcement on Twitter with more adult vitriol, largely in question of why Bell didn’t win or why Elliott wasn’t on the ballot. Why is it that the one person who should feel the most slighted showed the most class? No one will ever know if Bell threw a temper tantrum behind Warren Central’s closed doors, or even what Yoder or Lindauer and their cronies said for their individual cases. By the way, Yoder was #beastmode all season, but I digress. I didn’t get a vote. What this latest episode of the Young and the Classless on social media once again has shown is even when the IHSAA is begging and pleading, school administrators are mass mailing (or in the case of Center Grove, reprimanding), is that too many of us are still sitting on our hands, doing nothing as the red-faced goofs next to us continue to scream at officials, bad mouth coaches, and now, take aim at kids because their school isn’t the biggest and in the best conference. We’ve reached that level now. Rather than saluting Kiser for having a once-in-a-generation season and cap to a career atsone of the best teams in IHSAA history, sour fans from Indy and elsewhere decided to throw shade on his parade. And, honestly, for what? To then argue whether Bell was more deserving than Elliott on their own team? The subject line of the aforementioned email McIntyre sent out reads, “You are an example for our students.” It’s sad in celebrating the best, that the students set the example the adults couldn’t reach.